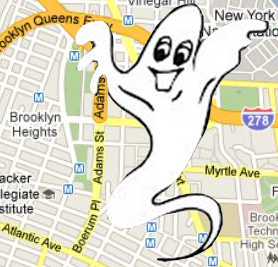 Halloween may be many months away, but Brooklyn Heights is already seeing a haunted spot of its own. A retail space at 41 Clark Street, on the corner of Hicks Street, has seen a rapid turnover of tenants who were unable to stay afloat in the neighborhood over the last 10 years, according to the Brooklyn Eagle, that is, when the space isn’t vacant. Disasters of many iterations, including reluctant patrons and lightning storms, have hampered many proprietors’ efforts to get a business off the ground in the 5,000-square-foot storefront. But that retail space isn’t alone: neighbors say two nearby store locations at 100 Henry Street and 60 Henry Street have experienced similar problems, leading one to wonder whether this is bad luck — or maybe just bad real estate.